Many people here in Richmond are still without power, so I am very thankful ours came back on so quickly. Did anyone get the chance to watch The Today Show yesterday? I tuned in for a few minutes and really enjoyed their segment on "Leisure Diving." Have any of y'all heard of it? LeisureDive.com features all sorts of crazy photos of people leisurely diving/falling into pools with props and costumes. The key to a good leisure dive, according to Today, was having a casual face, not one of "I'm about to dive in a pool with my clothes on!" 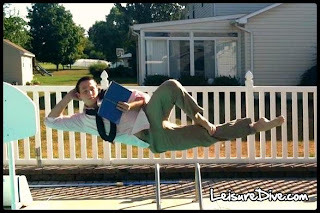 "Sunday at the Library Dive"
Would you ever leisure dive? I saw that segment yesterday too and definitely wasted some time checking out the website! 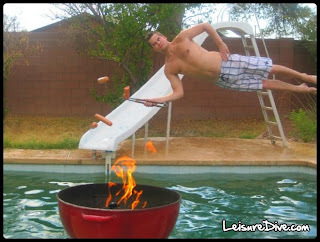 The pictures are so much fun and I think the "Hotdoggin Dive" is my absolute favorite. Glad you survived. That was some scary stuff! Too many Mother Nature interventions in one week! My bestie and I do this but instead we take pics jumping onto hotel beds! There's a website somewhere. I would most definitely come over to leisure dive with you! I feel like we should somehow incorporate being blog friends into our leisure dive. And invite Claire too! YES hahahaha invite me to the leisure dive! Love this! The nap one is hilarious! 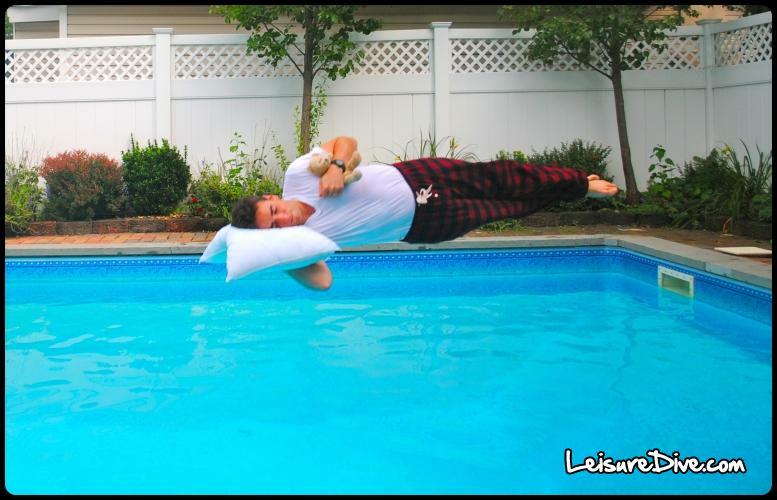 I would leisure dive all day long if it meant Dominion would give me my power back! Let's play soon! I love the hotdog and library photos! I'd never heard of this (I'm a GMA girl in the mornings) but what a funny idea. It's definitely not for me but I love clicking through the photos. I saw that yesterday on the Today show! I had heard of it and seen a few photos of it but thought it was hilarious the today show did something on it! 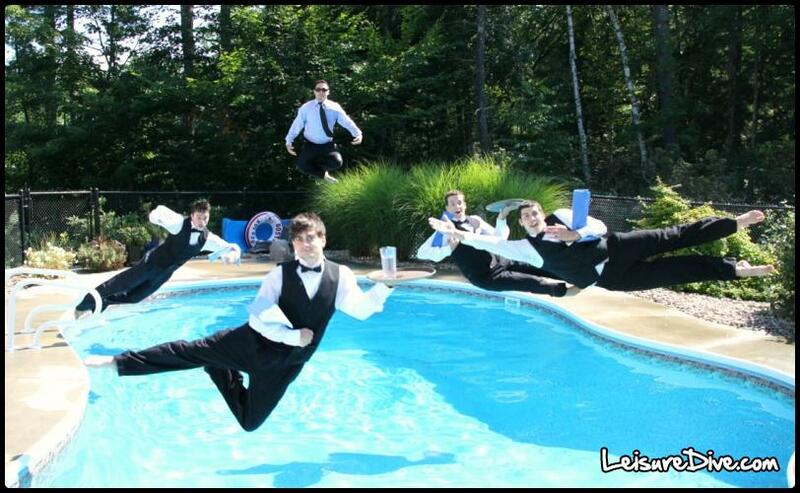 I don't think I could have a relaxed face as im falling into a pool! hahaha oh my gosh I have never heard of this, those pictures are hysterical!!! I love the Pool Service Dive. You have to post pics if you do this! I would totally leisure drive, haha. I'd just have to make sure that my clothes weren't too nice when I dove. I saw this on the Today show and thought it was so cool! What a great post! That's a hoot! I will have to go browse the web site. It looks like so much fun! this is too funny! I feel like it must take so many tries to get it right though! I have a C-ville pertinent question for you. My bf is coming up this wknd and wants to watch the opening USC football game. I don't have cable, so I figured we could go out to a sports bar or something and I could study at a nearby coffee shop while he watches the game. I was thinking somewhere on the mall? Do you know any sports bars or something like that at the mall? Hahah how funny! They look slightly photo shopped they're so perfect! It would definitely take me about 20 trys to get the right picture which really wouldn't work anymore cause I'd be soaking yet hahaha don't think I could do it! Great post! Made me laugh:]! btw I'm your newest follower!! So funny, I would totally do it. I can't get over the nap dive. My dad showed me this a couple of weeks ago and I think it's HILARIOUS! I want to know how these people do it right the first time.. cause if they tried to do it over again their clothes would be wet! That is too funny, some of those are really good! I think my face would not be as natural to "leisure dive". Oh my, this is hysterical! Don't think I'd ever do it but it makes me laugh!